With Coach O’Neill’s Black Team jumping out to a commanding 2-0 lead, the next 2 games became do or die for Coach Ward’s Blue Squad. Game 3 turned out to be the most exciting, nail biting game of the series, as Ben Taylor took the mound for the Blues with Dalton Rentz getting the ball for the Blacks. After “Big Donkey” Rentz shut the Blue team down in the top of the first, the fighting O’Neill’s got on the board immediately, as James Cunningham led off the bottom half of the frame with a single. Two batters later, Jeff Ronpirin had a single of his own. That followed with an RBI error off of the bat of Nick Jones and a huge double by Jared Martin to give Team Black a 2-0 lead against Ben Taylor and Team Blue. In fighting fashion, Ward’s team stormed back in the 2nd, scratching for a run on Cody Walker’s lead off hit by pitch, Timmy Massengale’s double, and Kaine Gibson’s RBI groundout to cut the lead in half at 2-1. From there, Taylor was completely dominant, allowing only a single hit over the next 4 innings of shutout baseball, giving his team a chance to climb back in the game. Dalton Rentz was nearly equally as impressive, as he made the lead hold until the 4th inning. After striking out the first 2 batters he faced, Dominique Smedley scorched a double in the left center field gap and Chris Brown followed him, sneaking a double just inside the 3rd base bag to tie the game at 2 apiece. “Donk” was lifted after the 4th in favor of Joey Stringfellow in order to get back to back lefties out. After striking out David Levy, he hit the next two batters. Dylan Lee entered for Stringfellow, who was nothing short of sensational in his relief stint of 4 innings of 1 hit baseball, and induced a 5-3 double play to end the inning. Both teams swapped zeroes for the next 3 innings of regulation baseball, as Jonathan Kizzar came on in relief of Taylor in the 6th. Seven innings would not be enough to decide this game, as game 3 headed into extra innings for free baseball. After a quiet top of the 8th by Coach Ward’s team, it appeared the same was going to occur in the bottom half after Jonathan Kizzar recorded the first 2 outs of the inning with relative ease. A two out single by James Cunningham followed by a walk to Matt Nettles ended the day for Kizzar. Trevor Guthrie entered and walked Jeff Ronpirin to load the bases and, in anti-climatic fashion, walked Nick Jones on 4 straight balls to give the Black Squad a walk-off walk en route to a 3-2 victory and commanding 3-0 series lead. On the verge of only the second sweep in Black & Blue Series History, Coach Ward sent Nate Morris to the mound for the Blues, while Coach O’Neill called on freshman Kevin Moore to hopefully secure the series win. The visiting Blues jumped on top early, as Dominique Smedley doubled to open the game. JD Perry reached on an error and Timmy Massengale singled home Smedley to give Coach Ward an early 1-0 lead after one inning of play. Morris quickly threw up a zero in bottom of the first to make the lead stand. However, the Blacks responded in the second with Nick Jones lacing a lead off single, and Ben Williams eventually scoring him to tie the game at 1-1. After a scoreless third, the Black team finally got to Morris in the 4th inning, as Matt Nettles was hit by a pitch, Jeff Ronpirin reached on a walk, and Nick Jones reached on a error on a sacrifice bunt attempt, which scored Nettles to give the Black Team a 2-1 lead with runners at 2nd and 3rd, still with no one out. Jared Martin then delivered the biggest hit of the series, lacing a 2 run double off of the left centerfield wall to clear the bases and put the Black Team ahead 4-1. Colt Ramsey spelled Morris after Martin’s double and shut the door on Coach O’Neill’s team, but not after another run scored on a Gaige Garret RBI ground out to put the Black Team in a 5-1 comfortable lead. After a shaky first, Kevin Moore took the game by the reins and tossed 6 innings of beautiful baseball, in which he did not allow another hit to the blue team, while surrendering only a single walk. His performance was exactly what the O’Neill’s needed after putting up a four spot in the fourth. Moore was pulled after throwing 6 complete due to the mandatory pitch count and Will Thomas was brought in to close out the game and the series, but Coach Ward’s Blues refused to go quietly. Ty Abbott led off with a single and Sam Knight drew a walk to start the inning. 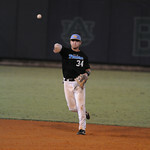 However, Thomas bared down and induced a 4-6-3 double play to David Levy and then struck out the final batter of the game to give Coach O’Neill his first Black & Blue Series win since the fall of 2009, as well as the first series sweep since Coach O’Neill’s black team won the fall of 2005 series. Catcher, Jared Martin, was named the series MVP, as he hit .400 with 3 RBI’s in the series, with the big blow coming from his series clinching double in the fourth inning of game 4.